Stack, Nest or Fold? Selecting the Right Container For You. Stack, Nest or Fold? A Guide to Selecting the Right Container. 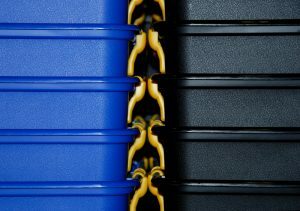 Plastic crates used for storage, handling and distribution applications are available in three main formats; stacking boxes, nesting boxes and folding boxes. All three designs stack when loaded, but the nesting and folding models also inter-nest or fold flat to save space when not in use. There are a number of advantages and disadvantages associated with each design which should be considered before purchase to ensure that users gain maximum value from their reusable packaging. The main benefits of stacking boxes are storage volume and simplicity of use. 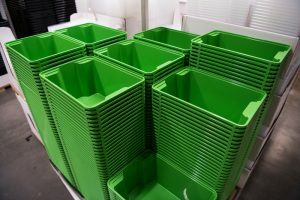 Plastic stacking crates, containers and trays have vertical sides for maximum internal volume. They usually have around a 7% larger storage capacity than stacking & nesting containers of the same external dimensions, which have tapering sides to facilitate nesting. The simplicity of stacking boxes speeds up handling operations compared to nesting crates (which must be rotated through 180o or have stacking bars or attached lids swung into position) and folding crates (which need to be assembled). 180o nesting boxes are tough distribution containers that securely stack when loaded and nest by turning through 180o. This simple, robust design is ideal for heavy-duty applications. Bale-arm crates, such as Maxinest produce crates, incorporate stacking bars which are pushed inwards to stack and outwards to nest. These crates are used throughout the food supply chain from field or food processor to retail point-of-sale. Attached Lid Containers (ALCs) include integrally hinged lids that can be secured with tamper-evident seals. ALCs are used for the secure distribution of parts, components and finished products throughout manufacturing and non-food retail supply chains and in many service industries. By nesting for the return trip, stacking & nesting crates reduce both transportation costs and carbon emissions. This is because space saved means that either more empty boxes can be carried on the return trip or other goods can be carried on the same vehicle as part of the distribution loop. This results in shorter journeys and fewer lorries on the road. Plastic folding boxes aim to provide the best of both worlds. Vertical sides offer comparative carrying volumes to stack-only crates and units fold flat to save space on return transport. There are, however, a number of constraints that should be taken into account. Folding crates are time-consuming to assemble and fold, there are more moving parts which make the boxes susceptible to damage and they tend to be less strong than stack-only or stack-nest models. Folding boxes are consequently ideal for less intensive lightweight distribution applications. Stacking boxes are perfect for internal storage and handling operations. Stacking & nesting boxes are ideal for local, national and most trans-continental distribution applications as the space saved on the return trip (around 70%) more than compensates for the relatively small loss in storage volume (around 7%). Balancing the assembly time, loading and durability constraints of folding boxes against their impressive storage capacity and space-saving return ratio when folded means that these crates can come into their own for longer national and trans-continental journeys. Although they do not nest or fold for return trips, stacking boxes should not be ruled out for distribution operations if the vehicles are used in a closed loop and would otherwise return empty. However, users should review their own distribution practices to see if savings can be made by maximising vehicle fill throughout the supply chain.